The defender celebrates with Jurgen Klopp and Jordan Henderson last night. VIRGIL VAN DIJK believes Liverpool can use their Champions League escape against Napoli as a springboard to win Europe’s elite club competition. Jurgen Klopp’s side booked their place in the last 16 with a tense 1-0 win over Napoli at Anfield on Tuesday. A fine finish from Mohamed Salah put Liverpool ahead, but the Reds needed goalkeeper Alisson Becker to make a superb save to deny Arkadiusz Milik in the closing seconds before they could finally relax. Liverpool are also top of the Premier League after going unbeaten in their first 16 games this season, raising the prospect of Klopp’s men winning a first English title since 1990 while also challenging for a sixth European Cup. Dutch defender Van Dijk sees no reason why Liverpool can’t win the Champions League this term after losing last season’s final against Real Madrid. “It’s something that we all want, it’s something that we are going to give everything for,” Van Dijk said. “We want to play on the highest level and the Champions League, other than the Premier League for us, is the highest level. “We want to reach the maximum and hopefully do better than we did last year in the Champions League. You need to have dreams, you need to go for it, otherwise why would you be a footballer? Liverpool have conceded just six goals in the league this season and, after some less solid displays in their previous Champions League games, they managed to replicate that domestic defensive strength to keep Napoli at bay. 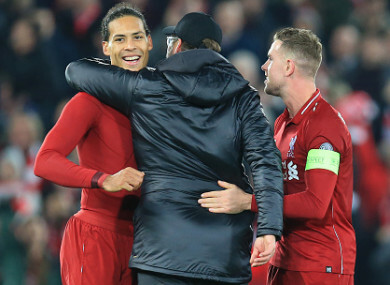 Van Dijk revealed much of that is built on the team ethic which means the players being confident enough to challenge each other in order to maintain their high standards. “You need to be hard with each other. When things aren’t going right you need to tell each other, otherwise it’s going to be too easy. I think that’s a sign of a good team,” he said. “When people are shouting at me I take it because they want to make me better and (if it is) their mistake they take it as well if I shout to them. Van Dijk said Liverpool had been frustrated at missing “big chances” against Napoli, including one opportunity that he himself volleyed over the bar. “We could have made it a lot easier, we could have scored another two or three, we didn’t, and then it was important for us to win our battles and keep it tight and we did,” he said. Email “Van Dijk targets Champions League glory after Liverpool escape”. Feedback on “Van Dijk targets Champions League glory after Liverpool escape”.